Now Open for Lunch & Dinner! 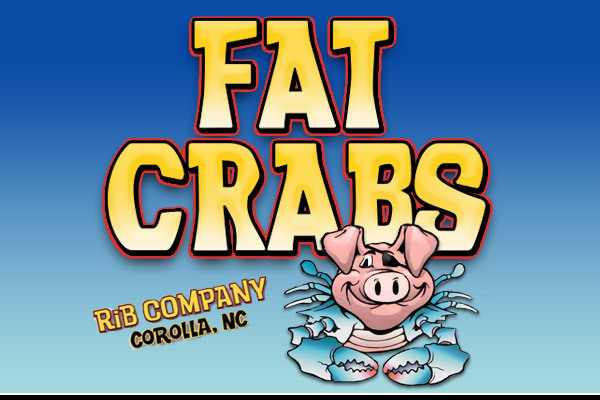 At Fat Crabs Rib Company in Corolla NC, located at the Corolla Light Town Center, you’ll experience a combination that you will not find anywhere else: traditional Carolina barbecue and coastal cuisine all underneath the same roof. And you have the choice to eat in or carry out. The Fat Crabs Corolla NC restaurant is fun for the whole family and has eating options for everyone, with barbecue pork, chicken, ribs and brisket all smoked in-house alongside fresh local seafood. Come in for great raw oysters, Outer Banks seafood, oysters, scallops and shrimp, hush puppies and coleslaw. Experience the #1 rated crabcake from here to the other side of Hatteras Island. Fat Crabs Rib Company also has great fixings in the form of homemade sides and desserts. Fat Crabs Rib Company also has the friendliest and hardest working folks in town. Our wait staff offers that famous Southern hospitality. The dining room is bench-style seating with a laid-back, family-friendly atmosphere. The food will be served to you piping hot, prepared right behind the counter where you can watch the magic happen. And don’t worry if you’re gluten-free; we’ll even make you a special gluten-free cocktail sauce. Whether you’re by yourself or with a group, there are plenty of options for you at this Outer Banks restaurant, where you can order a la carte or by the pound. Enjoy beer and wine both on and off premise! We have a massive imported bottled beer selection and many hard to find craft beers as well. Whether you’re dining in or carrying out, this Corolla NC restaurant has moderate prices that will fit into your vacation budget and add something special to your time on the Outer Banks in return. If you have an exceptionally large party or you want to reserve blue crabs or steamers, please call ahead to ensure that the restaurant is ready for you, but the team at Fat Crabs Rib Company will always do their best to accommodate. Takeout orders welcome. Be sure to call early and reserve your pickup time! Wide selection of cold bottled beer and local microbrews on tap. Variety of wines. We'll even cater special events!